As may be apparent, I like mysteries. Many of the local enigmas I've covered in this column offer little hope for ultimate resolution; often it is a question of belief - you believe in ghosts, and that a particular house is haunted, or you don't and it ain't. Some can't be scrutinized closely enough from afar: for instance, when some strange object whizzes across the sky, unless you're there to see it, who knows? Some local mysteries are a little more accessible, built into the landscape itself. Their existence is plain as day, their idiosyncrasy unimpeachable. This is especially true in the case of the stone tunnels dug into the earth in Goshen. The casual observer, coming across the simple stone shaft not far from the cemetery might not think too much of it at first. One might easily surmise that this hole, 15 feet deep and about 3 1/2 feet in diameter, once served as a well. However, near the bottom, this "well" opens onto two more stone-lined shafts protruding out in each direction. The lower tunnel runs west and is narrower and appears to have been meant as a drain to keep the main shaft from filling up with water. It is capped off by flagstones about 70 feet from its mouth. Above it, a slightly wider tunnel measuring 2 by 2 1/2 feet - just large enough to accommodate a crawling adult - runs east about 15 feet toward the cemetery. It is believed that this upper shaft once opened onto a chamber of about 10 square feet, but this caved in long ago. People have been wondering about these stone tunnels for a long time. Tradition has it that the tunnels were discovered in the early 1800s by two boys who chased a rabbit into its burrow, and in the process of trying to dig it out, they dislodged the flagstone covering the main shaft, which had been buried under sod and bushes. The construction is sometimes called the "Counterfeiter's Den," in keeping with a local legend that they are part of a vast network of tunnels that ran to a hideout under the cemetery used by a savage gang. Some say that the hideout was dynamited and that the ghosts of the gang still haunt the cemetery. Another variation of the legend has it that they were really grave-robbers, not counterfeiters. The truth is, there's really no evidence to connect any criminal gang with the Goshen tunnels, and their discovery took place before the cemetery was laid. The "Hampshire History" speculates that the structure might have been a shelter from Indian raids. The only problem with that theory is that Goshen, first settled in 1761, was never in any danger of having to worry about such raids. The sheer time and effort required to quarry and place the flagstones with which the entire complex is lined more-or-less precludes the possibility that anyone could have constructed it in the last two centuries without some historical record existing to describe who built it or why. The very fact that there is no definitive answer to these questions argues strongly for a pre-colonial origin. It may be that the structure was built by some Native American culture that moved on from these parts long before any white people arrived. If so, it must have served some important function, for so much work to have been put into something so difficult to traverse. It is also likely that that it was not a solitary effort. Archaeologist Salvatore Trento suggests that the tunnels "in all probability, are part of a larger complex of underground constructions yet to be found in the meadows surrounding the Mill River." 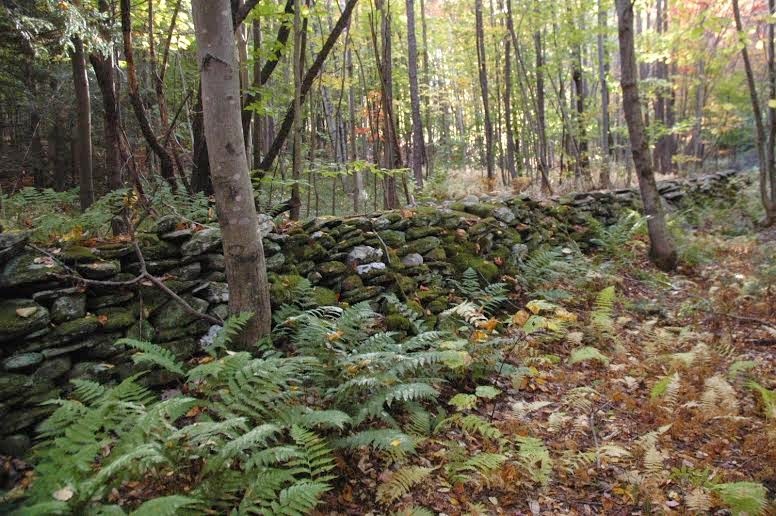 Some scholars see similarities between Goshen's underground lair and a stone tunnel in Upton, and with hundreds of other ancient sites around New England - such as Salem, N.H.'s "Mystery Hill," a.k.a. "America's Stonehenge." Many of these sites have been put forth as possible examples of exploration by Vikings, Celts or other visiting cultures that left no other record of their stay. Signs of human presence at Mystery Hill date back possibly as far as 2000 B.C., and at least one source has stated that the samples of soil from around the tunnel indicated that it too might have been dug thousands of years ago. I haven't been able to substantiate this last, so at the present time the age and purpose of the complex remains as much an enigma as ever. I find myself very curious about the ancient people who might have been here. Were they building a hideout from enemies? A place to store precious treasures? Did it have some ritual significance, as with certain similar prehistoric tunnels found in Scotland and elsewhere? I can't help but wonder what went through their minds as they dug holes into these hills, unaware of the tantalizing mystery they were leaving behind for later inhabitants. Joe Durwin is a Pittsfield native on extended sabbatical in the desert. Send him accounts of unexplained experiences, strange tales or haunted places at joe@durwin.net. Just happens to be on my property. No, this is actually on my property! Who cares whose property the tunnels are on. They are apart of 5th and 6th dimensional time frame. We as humans fell to 3rd dimension and every dimension we climb back up we grow. 5th men are 14-15 ft tall and women are 10-12 ft tall. 6th we get even taller. I have been privileged to meet tall beings that are 15-18 feet tall. and angels who seem 25 ft tall. They monitor us in this grid matrix while we work towards going back up in dimensions. It is up to each one of us to do the work. So why not work together on finding out our past to better understand where we are going home too. Umm...Sherry is CRRRAAAAZZZZYYYY! Everybody run while I distract her. Hey Sherry...what you doin? The engraved stone near the Goshen tunnel looks to me like a list of initials. Has anyone ever checked the local census records for 1792 - the date inscribed in the far left of the stone - looking for a group of people in the local community or surrounding area or an organisation whose members initials match those on the engraved stone? And if so, could they be linked in some way to the Goshen tunnel? It seems to me that all the explanations as to what the engraved lettering on the stone near the Goshen tunnel means, are much too complicated and far-fetched. Why create a mystery when a much more simple answer could be found? I'd be really interested to know if my theory on the meaning of the engraved stone near the Goshen tunnel could reveal any solution. David Backhurst, 31 Lower Knole Lane, Brentry, BRISTOL. BS10 6SA. I went there last summer and got to explore the cave. It was awesome. Then I went back and I had a bad feeling. A tree fell for no reason, I felt very uneasy, saw a huge spider in the tunnel, so I decided to not go into it and explore the nearby cemetery instead. A bunch of the gravestones had these strange faces carved on them that looked kind of like aliens. Can anyone explain this? What are those beings called? and how did we fall to the third dimension?